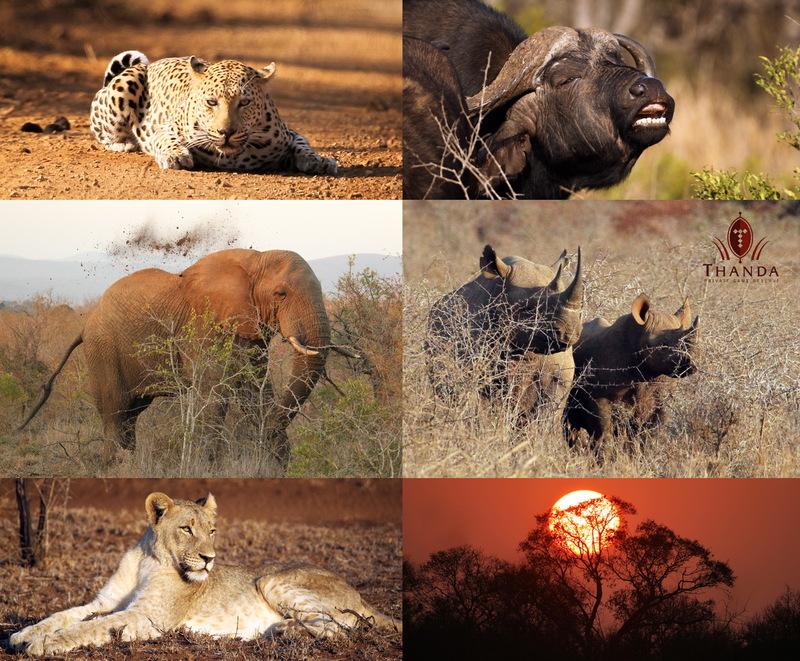 It happens quite often that Thanda guests can experience more than one of the Big Five during a single game drive. But it is a very rare treat when all five of Africa’s most famous animals make their appearance within a single 3.5 hours drive. Today was such a day. During this morning’s drive we had an excellent sighting with a few Elephant bulls, watched five young Lions waiting for their mothers’ return from a hunt, spotted three Black Rhinos on an open savanna area, observed a large herd of Cape Buffalo grazing and then – most spectacular of all – surprised a beautiful male Leopard on our way back to Thanda’s Villa iZulu. It is hard to believe that we also saw Giraffes, Nyalas, Impalas, Warthogs, Wildebeests, Zebras, Yellow-billed Hornbills, Cape Glossy Starlings, Red-billed Oxpeckers and a Brown-hooded Kingfisher on the same drive. This collage shows six images taken on this drive! What a Thanda morning to remember! What a morning indeed! As always, we enjoyed your fabulous photos. Definitely a morning your guests will never forget!